Dimensions: Approx. 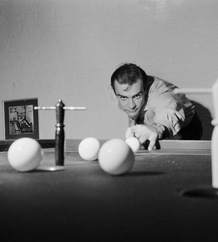 10.5" x 13 7/8"
Scottish actor Sean Connery, the new face of super spy James Bond, enjoys a game of bar billiards at his basement flat in London's NW8. Copyright Getty Images. Approx. 10.5" x 13 7/8"